Americans drink more than 40 gallons of soda per person, per year. Despite new dietary guidelines calling for a reduction in sugar consumption, government policies encourage farmers to grow crops that become processed into sweeteners. The new dietary guidelines issued early this year by the federal government highlight the great paradox of food in America. We’re advised to eat less sugar and more fruits and vegetables in order to stay healthy. But at the same time, our government supports a food system that churns out the polar opposite meal plan—one that’s designed to mass produce the foods we’re not supposed to eat, while also generating pollution that harms air quality, water quality and climate. The dietary guidelines recognize the importance of healthy eating patterns, but also illustrate how our food system works against us. In order for America to really eat healthy, we need to redesign our food system, from farm to fork, so that we can sustainably produce healthy, affordable food for everyone. Today, more than two thirds of adults and one third of children in America are overweight or obese. One reason for this, as Marion Nestle points out in her book Soda Politics, is soda consumption. 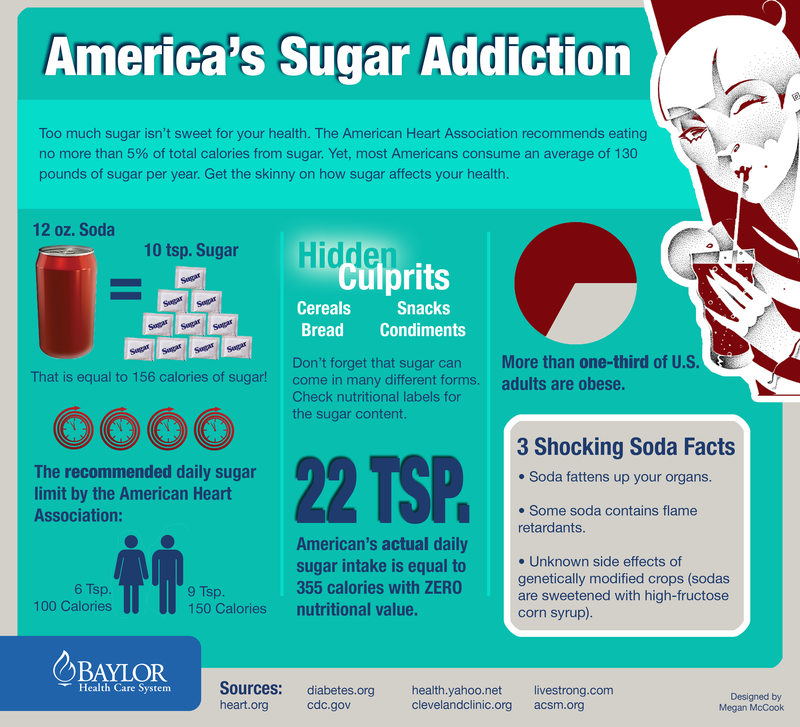 A 12-ounce can of Coca-Cola or Pepsi contains about ten teaspoons of sugar—and Americans drink more than 40 gallons of soda per person, per year. That’s more than a can a day, on average. The guidelines advise cutting back on sugary beverages. But here’s the irony: While we’re being urged to consume less added sugar, government policies encourage farmers to grow more field corn, which is the main source of that added sugar, in the form of high fructose corn syrup. From 1995 to 2012, the government paid more than $84 billion in corn subsidies. That’s nearly $5 billion a year in U.S. taxpayer money to make the corn syrup and animal feed that goes into the processed foods and meat we’re supposed to eat less of. Sugar beets and sugarcane, two other sources of added sugar, enjoy a package of subsidies, price supports and tariff protections that cost consumers about $1.9 billion in 1998 alone, according to the Government Accountability Office. Again, we’re paying billions to support the mass production of foods that should only play a minor role in our diets. In order to shift, on a national scale, to a diet that protects our health, we need to design food and farming policies that make our food system healthier. In addition to the billions in healthcare costs that result from diet-related diseases, we pay a heavy environmental cost for industrially grown corn and sugar. Corn uses more water and more fertilizer than any other U.S. crop, according to a 2013 report from CERES. Much of this corn is grown in areas of high water stress. And excess nitrogen fertilizer from cornfields is the single largest source of the pollution that drives the Gulf of Mexico’s “dead zone,” an area the size of Connecticut and Rhode Island combined that is essentially devoid of life. Sugar takes a toll on the environment, too. Excess phosphorus fertilizer from sugarcane fields is a major source of the pollution that is choking the Florida Everglades. Another irony is that the new dietary guidelines urge greater consumption of fruits and vegetables. Americans, on average, eat only about half the amount of fruits and vegetables recommended by the USDA. Yet these fruits and vegetables we’re supposed to double up on get very few subsidies or protections from the federal government. Indeed, farmers who get taxpayer money for growing corn or soy have historically been restricted from growing fruits and vegetables. A recent tweak in the federal farm bill now allows them to plant some, but only on a very small portion of land. The final irony is that, by law, the dietary guidelines are supposed to be based on the best current scientific and medical knowledge. Yet the final guidelines dropped two critical recommendations from the government’s own committee of scientists—that a healthier diet should be “lower in red and processed meat” and “sustainable for both the current population and future generations.” These recommendations were dropped despite strong support from the public, as well as health professionals, environmental advocates and many city mayors. The new guidelines are a step in the right direction, but they miss the big picture. Diet, health and the environment are all intertwined. In order to shift, on a national scale, to a diet that protects our health, we need to design food and farming policies that make our food system healthier, less polluting, more sustainable and more accessible to everyone. There is a growing movement to urge such changes, begun by the Union of Concerned Scientists, Food Policy Action and the HEAL Food Alliance, called Plate of the Union, and anyone can join. Through this and other initiatives, it’s time to put our taxpayer money where our mouths should be.